Our homeschooler only had formal piano lessons at home for no more than a couple of months. Our family got caught up in things that took our resources and attention. More than a year since we have stopped our homeschooler with supplementary classes and he has been creatively working on his interests, one of which is playing the keyboards. 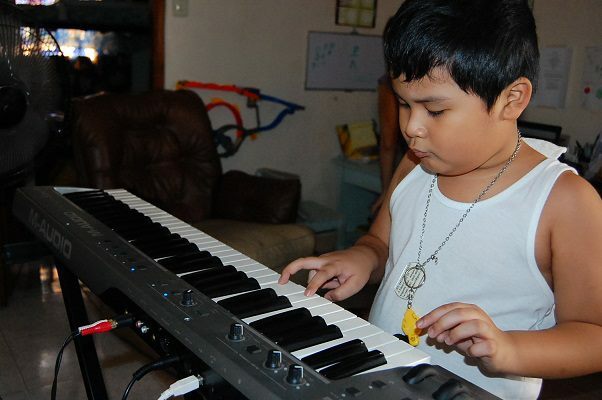 He has been thoroughly using the M Audio Pro Keys Sono 61 keyboard we got him last year. We first thought we should have bought him a Yamaha or one of those more popular keyboard brands. But we figured this one was a good investment since it has the capability to record. I think the hubby has figured out how it works and has already taught bits of this and that to the little man. 🙂 There are a few nice m-audio keyboards at musicians friend but we bought ours from a music shop in SM Megamall for around $600. Back to supplementary classes, we are seriously considering enrolling our homeschooler with Galileo for his Singapore Math training. We figured if we are shooting for our son to enroll in a Science High School, then he should get better at Math. Although he is getting through Math, the subject is obviously not his favorite. His mistakes in his Math tests are more of carelessness but it would benefit him better if he figures Math out like how Singapore Math approaches the subject.